Located in St. Louis County real estate, homes for sale in Webster Groves MO are centrally located in an inner ring suburb the St. Louis area. Webster Groves is a sought after established community that is environmentally responsible and has some of the most beautiful yards St. Louis County has to offer. Webster Groves MO Real Estate and Webster Groves MO properties are a perfect addition to the St. Louis Real Estate market. Webster Groves real estate is made up primarily of well-established homes. Homes for sale in Webster Groves MO range in price from about $100,000 to $1,000,000. The median home price in 2014 was approximately $325,000. Residents of Webster Groves enjoy a non for profit Farmers Market featuring food from local farmers and artisans. The community is rich in history and the city website provides different walking tours that showcase the history and the wide variety of architectural home styles dating back to the early 1900’s. The Webster Groves School district has received numerous accolades and include six elementary schools, a 6th grade center, a middle school and Webster Groves High. See Great Schools for up to date ranking on every school in the area. If you are looking for a home for sale in Webster Groves MO or you would be interested in buying a home in Webster Groves, please contact St Louis County real estate expert, Sharon Colona and St. Louis Realty for a professional and simple buying or selling process. Call (636) 397-7653 or email at scolona@stlouisrealty.net. This elegant brick home on .64 acre, offers a flexible floorplan with fabulous updates & is walking distance to downtown Webster & Bristol School. The entry foyer opens to a dining room with beautiful molding and fireplace. Steps away is a spectacular new kitchen with custom cabinetry & exhaust hood, Quartz countertops, Wolf & Sub-Zero stainless appliances & wine & beverage center with wine & beverage coolers. The kitchen adjoins a light filled breakfast/sunroom. Off the kitchen is a lovely hearth room opening to an additional living area. There are walls of windows & many architectural details throughout. The 1st floor also boasts a guest suite with renovated bath & water closet with shower & heated floor. Upstairs master suite & sitting room has 2 walk-in closets. The 2nd floor renovated hall bath also includes a heated floor. Laundry areas are on both 1st & 2nd floors. This Home is impeccably maintained & lends itself to both modern and traditional lifestyles. Webster at its finest! Welcome to 332 North Bompart Avenue, a Tuscan inspired atmosphere that blends farmhouse elements for a sophisticated, warm and inviting feel. Five bedrooms, 3 baths, all modernized while maintaining their distinct personality, for a contemporary, yet rustic aesthetic. From the moment you enter and see the intricate, architectural details of textured walls, columns, and archways, and experience the open concept and flow of the floor plan, you'll be planning your next gathering of family of friends. Abundant and beautifully appointed living spaces with a gourmet kitchen sure to delight any chef with all of the expected high-end finishes and appliances. First floor master suite with fabulous, marble bath, his and hers closets with built-ins, and a window seat. The first floor also houses a butler's pantry with wet bar and two wine coolers, a laundry room with cabinets and cubbies, as well as another bedroom and full bath. Up the wood spindled staircase are three bedrooms and a bath. This 5 year old custom build with serene park and golf course views and over 3600 square feet of living space, offers the joy of newer construction without sacrificing the charm of a century home. Not a detail missed with 9 x2019; ceilings, board & batten wainscoting, crown molding, job finished hardwood flooring and an oversized 3 car garage. Gourmet kitchen, separate dining area with doors leading to the cedar observation deck, living room, xBD; bath and separate office complete the main level. 4 bedrooms on the 2nd floor including the luxury master suite with vaulted ceilings, a lovely full bath and laundry room. The finished LL offers large family room/rec area, 5th bedroom and full bath. The lushly landscaped park like yard with perennial gardens, irrigation system and vintage brick patio w/ built in firepit create the most peaceful setting outdoors. There is truly so much to enjoy about this spectacular home, all within walking distance to downtown and award winning schools. Agent Owned. One of Two New Homes To Be Built by MRM Manlin Development Group on this Street! Buyers may make their personal selections on this 4 Bed 2.5 Bath 2 Story in a Fantastic Webster Groves Location, Surrounded by Other New Homes. Sophisticated in Style with Rich Finishes. Hardwood Flooring, Wainscoting, Crown Molding are Featured on the Main Level. Great Room w/ Direct Vent Fireplace. Center Isle Kitchen w/ Stainless Steel Appliance Package, Solid Surfaces and Tile Backsplash. Main Floor Laundry. Grand Master Suite with Coffered Ceiling, (2) Walk in Closets, Luxury Master Bath w/ Separate Soaking Tub, Shower and His and Her Vanities. Fabulous Deep Level Yard. Bonded Builders Warranty Included. This brand new home is loaded w/ standard features and on a fantastic lot (50'x270')! Unlike much new construction, the base price of this home already includes countless upgrades! Enjoy all that Webster Groves has to offer in this home, w/ the added benefits of new construction! This luxury home boasts 5 BR's, huge great room, formal dining, fireplace, 8'10 bsmt pour, wood floors, 2 zone hvac, 9' 1st floor, wood stairs & so much more! The gourmet kitchen features an island w/countertop extension, granite, gas oven/range, tile backsplash & walk-in pantry. In the master suite, you'll find an enormous walk-in-closet, sep tub/shower, double sinks & sep water closet. The finished lower level includes a bedroom, 3/4 bath & a huge rec room! The exterior has wonderful curb appeal w/covered porch, sod, landscaping, architectural shingles, stone details, covered deck & much more! Quality and details abound throughout this lovingly cared for home which sits on just under a 1/2 acre corner lot with a park like setting. This beautiful colonial offers 4 bedrooms, 3 1/2 baths, spectacular finishes throughout and an abundance of natural light. The original home, circa 1929 boasts hardwood flooring, glass doorknobs, gorgeous mahogany woodwork and high ceilings flowing naturally into the 2014 addition which stays true to the original footprint while offering a modern twist with an open concept kitchen/family room, mudroom, 2nd floor master suite and laundry. In addition, this property offers amazing outdoor living spaces surrounded by established trees, professional landscaping, irrigation system, a 2 car detached garage and an additional 10x12 storage shed. This timeless Webster Groves home within walking distance to parks, award winning schools and downtown Webster Groves shopping district awaits the fortunate buyer. OPEN HOUSE 2/10 1:00-3:00. Just finalizing the finishing touches on this amazing New Construction in Webster Groves! Fabulous open concept on main level. Four very large bedrooms, three full baths and over 2,800 sqft. James Hardie siding, hardwood floors on both levels and 9ft pour with egress window in lower level and rough-in. Master has walk-in closet fit for a King AND Queen! Gracious master bath with separate soaker tub & separate vanities. Main floor laundry room, bath and mudroom lead to outside area with 2 car garage and southern facing back yard. Great block with a solid mixture of new and old homes! This one was built to fit right in! Excellent location in the heart of Webster Park! So much light throughout - windows galore! And with 3124 sq. feet and on a .4 acre lot, it's perfect! 4 bedrooms and 2 bathrooms on the 2nd floor (master suite is huge and with lots of closets and a 13x7 alcove ideal for an additional walk-in closet! ), a main floor family room with more windows and more light, the dining room with its corner curios and picture window overlooking the yard, a spacious kitchen that opens to a 20x19 screened porch, finished 3rd floor with skylights and more light galore and 2 car covered parking will all help make your new home dreams come true! Backs to open green space so the view is fabulous! Seller is Motivated! Gorgeous 2 xBD;-Story, Webster Groves Century Home. Totally updated main & second floors, includes high-end tile, carpeting & wood flooring. Elegant Entry foyer leads to Large Living room with fireplace and then to beautiful Formal Dining room, great for entertaining! The superb gourmet kitchen has granite counter tops, stainless steel appliances, is part of a larger Great room that encompasses a Breakfast-room, Dinner bar, 2 pantries. Large main-floor Laundry room and Mud-room has separate entrance conveniently located off the deck & back-yard. The 2nd level has a Wonderful Master Bedroom Suite with Additional 2nd-fl. laundry-room, three large bedrooms and 2nd full bathroom. The 3rd floor (currently attic space) is ready for you to finish. Rear deck and wrap-around porch are perfect for relaxing in privacy with family & friends. Close to schools, shopping, Webster University near Hwy I-44 & I-270. You will Love it!! First available for Open House, April 14 from 1-3. Elegant Century home in the heart of Webster Groves with 3 bedrooms and 2 1/2 baths. The charming covered porch is the perfect place to enjoy the Webster Grove 4th of July Parade. Gracious foyer leading to the living room w/ gas fireplace, lge separate dining & updated eat-in kitchen. A convenient 1/2 bath completes the first floor. Upstairs, a master suite w/ full bath, 2 bedrooms & spacious full bath w/ second floor laundry. The vaulted ceilings on the 3rd floor make the space feel large & includes an office nook w/ french door for privacy & two cute window seats. Zoned heating & cooling for 3rd floor keeps the space cool in those hot months. Enjoy being outside on the deck or relaxing in the hammock. The 2 car garage has separate automatic doors & poured concrete basment; accessible through the garage or from backyard. Perfect for storage or home workshop. Beautifully landscape and so close to shops, restaurants, schools and parks. 661 Lockwood Court starts with an utterly charming Tudor exterior that mixes brick and stone with steep gables and fabulous leaded glass windows. Inside this 1920 x2019;s era home, hardwood floors cover the main living areas of both the first and second floors, adding to the warmth of the original hardwood trim and gorgeous stone fireplace. The white kitchen has been recently refreshed with new countertops, appliances and tile floor. Three bedrooms and two full baths on the second floor include a master suite, while one additional bedroom and a half bath on the main floor create numerous possibilities. There x2019;s a distinct feel of days gone by on this one. Yes, kids really do still walk to school and play on church parking lots in this awesome neighborhood! Looking for Webster charm, but with updates for a 2019 lifestyle? 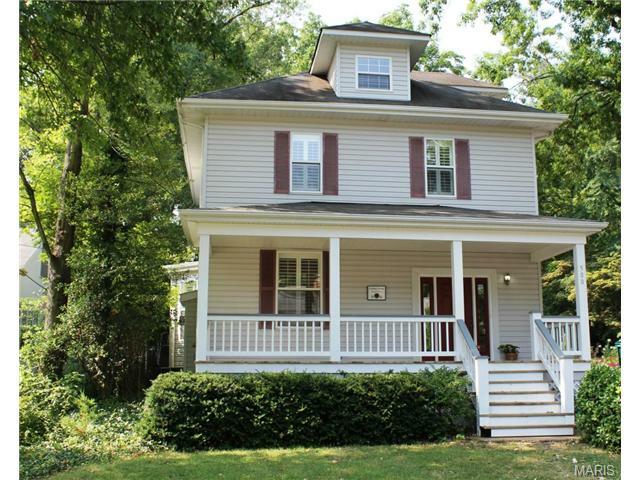 This refreshing 1869 Colonial has the perfect combination of both! Terrific curb appeal and an abundant amount of natural light throughout. The main level includes living room, dining room, renovated kitchen which opens to a family room, an awesome main level laundry/mud room, plus an office/playroom, and a full bath. Upstairs, you will find four bedrooms and another renovated full bath. The screened porch overlooks the deep and spacious rear yard complete with a patio and a detached oversized 1-car garage. The pride of ownership is evident throughout as are the well appointed finishes - the home is owned and designed by an amazing Residential Home Designer! Webster Historical Society plaque shows 1869 construction; county shows 1910 - please see history documents in supplements. Walking distance to Webster U and convenient to I-44, shopping and all of Webster's charming parks, restaurants, and shopping. Welcome home to 832 Atalanta Avenue, a stunning, brick, center hall colonial in sought after Tuxedo Park with all of the expected attributes of a great family home. A beautiful front door opens into the entry hall with white spindled staircase. To the right is the living room, which runs the length of the first floor. It is full of light with hardwood floors and a decorative fireplace as a focal point. The ample dining room is to the left and flows into the kitchen, which circles around to the 1/2 bath situated at the back of the entry hall. The family room is off the kitchen and steps onto the screened porch and then onto the large deck overlooking the level, fenced back yard. Upstairs are three bedrooms, all with hardwood floors. The generous master with his & hers closets is the same footprint as the living room below. The unfinished, walk out lower level has plenty of storage space and accesses the rear entry garage. Close to parks, shops and restaurants. MOTIVATED SELLER OFFERS 1 YR HOA FEES ($6000) CREDIT AT CLOSING. 2019 rehabbed kitchen with freshly painted white cabinets, new appliances and sparkling granite counters. Large new rear deck also added 2019. Villa style unit with own entrance & 2 car attached gar. Gracious 2 story entry. The lg rooms with gorgeous windows & lovely trimwork are light, bright & airy. Ample family room with wood floors, wetbar & gas fireplace is center of the home. It opens to the kitchen, giving the condo a very spacious open feel & great flow.. Convenient first flr laundry located off kitchen. The master suite is huge & the en suite bath has a double vanity and separate shower & tub. Two more bedrooms & hall bath complete the second level. Home is very convenient to highways, schools, churches & shopping. Why spend time doing yardwork & exterior upkeep when you can live maintenance free in this lovely condo? All ext maintenance, bldg insurance, lawn, snow removal & trash are covered by association fees. This well maintained home is located a super convenient, desirable, architecturally interesting and friendly neighborhood! Low maintenance Brick exterior and an immaculate and spacious interior. The main level has a large living room with wood floors, crown molding and a wood burning fireplace to keep you warm in the winters. Dining room with wood floors connects into the kitchen with ceramic tile and some newer appliances. Behind the kitchen is a great 4 seasons room with ceramic flooring, vaulted ceiling and lots of natural light flowing in from the two sets of french doors that lead to the large deck on the rear of the home. Two good sized bedrooms and a bathroom finish out the main level. Upstairs has 2 more large bedrooms that share another bathroom. xD; xA;The convenience of this home is unbelievable! less than 2 miles from Hwy 44, less than 3 miles from Hwy 64/40, 6 miles to Hwy 270, 5 miles to West County Mall. No matter where you're headed, you're already almost there! Location is Key!Enjoy front row seats to Webster fireworks, Carnivals, and parades that can be viewed from your spacious deck. Did I mention the kiddos can walk right out of the large back yard and to the Webster Rec Center, nearby schools, and beautiful parks. This refreshed beauty offer a open floor plan for easy entertaining, all new in summer 2018 are Kitchen cabinets, stainless steel appliances, granite counter tops, updated baths, all new lighting,flooring throughout,freshly painted, patio door with built-in blinds, and much more, all that is left to do is move right in! Quaint two-story bungalow offers hardwood floors, crown moldings & arched openings! Living room features stone stacked, wood burning fireplace and is open to dining room thru large arched opening. Dining room adjoins the bright kitchen with white cabinetry. Cozy office space. Currently staged as family room with exposed brick wall & walk-out access to deck could be used as main floor bedroom with dual closets by simply hanging a door! Upstairs you x2019;ll find nice sized bedroom with hardwood floors, second bedroom & full bath. All appliances stay x2013; refrigerator, washer & dryer makes this one move-in ready! Great location and curb appeal! This three bedroom, brick, 1 1/2 story is full of charm with formal living and dining spaces, a light, bright kitchen with 42 white cabinets and adjoining breakfast room with bar and built-in corner cabinet. Two bedrooms and a bath complete the first floor. Head upstairs to the third bedroom with quarter-round and eyebrow windows, a door that accesses the garage rooftop, and plenty of storage. There's also an enclosed porch off the back with a curved wall of windows, a mosaic floor that adds lots of interest and walks out to the deck and level, fenced back yard. The walkout lower level is partially finished with a rec space with decorative fireplace and another room that would make the perfect wine cellar. Summer will be great as you can step out the front door and walk to the rec center to swim or skate. Easy access to highways and all of Webster's great shops and restaurants! Welcome to marvelous 8265 in beautiful Webster Groves! This is the perfect gem for a lovely family to build memories of a lifetime. This home boasts wonderful brick decor on the outside and an amazing functional floor plan inside. As you enter the home, you will be taken away by the arched doorways and the brick fireplace meant to keep you warm on cold winter evenings. The bedrooms are uncharacteristically large for the area, and will allow you to rest in peace after a long day's work. The back room is large and accommodating for a family/office area with room to spare. The partially finished basement is perfect for a recreation room and a work area for those DIY projects you'd like to complete in the future. Finally, the spacious 1 car garage with entry into the home is perfect to protect your vehicle from the elements. This home is more than you could imagine all in spectacular Webster Groves! MUST SEE! This one won't last long!